So on to the products... these 15ml* glass jars are quite possibly the most luxuriously packaged sample/travel sizes I've ever tried. If we were being superficial and judging by looks alone, they would definitely have to get 10/10! I've been able to give them a proper trial to see how they perform since they've lasted a few weeks and there's one product in particular that's a stand-out favourite! I'm already a fan of cleaning balms in general so I knew I'd enjoy using this product. It contains a range of vitamins, minerals, omegas and prebiotics to cleanse and decongest the skin. To use, simply massage onto face and neck, avoiding the eye area. It's quite a thick balm which melts into the skin and emulsifies into a light milk texture when combined with water. It can be rinsed off with water or removed using a muslin cloth, which I definitely prefer. I find this cleanser leaves my skin feeling soft, really clean and balanced too. I'm intrigued to try the Renaissance Cleansing Gel next time! I think this has to be my favourite out of the three products! This is a brightening and resurfacing mask which uses lactic acid to increase cell turnover and fruit enzymes to remove excess skin cells. It has a thick consistency, somewhere between a gel and a cream, and it's a light pink colour in the jar which turns white when massaged into the skin. I leave this on for about 10 minutes before rinsing off and I'm always amazed to see the frown lines on my forehead noticeably reduced! It works wonders for skin texture and tone and I imagine it would be particularly great to use on dull winter skin. This night cream is designed to give the skin a nourishing and regenerative boost. It's said to help prevent the signs of premature ageing, although I can't quite comment on that one since I'm only in my mid-twenties! The texture is surprisingly light for a night treatment, yet it's still really hydrating. This is the most expensive product of the three and would have to be my least favourite of the bunch since I didn't notice much of a difference to my skin when using this, although my overall complexion did seem a little softer! I think this would especially be an ideal product for more mature skin! 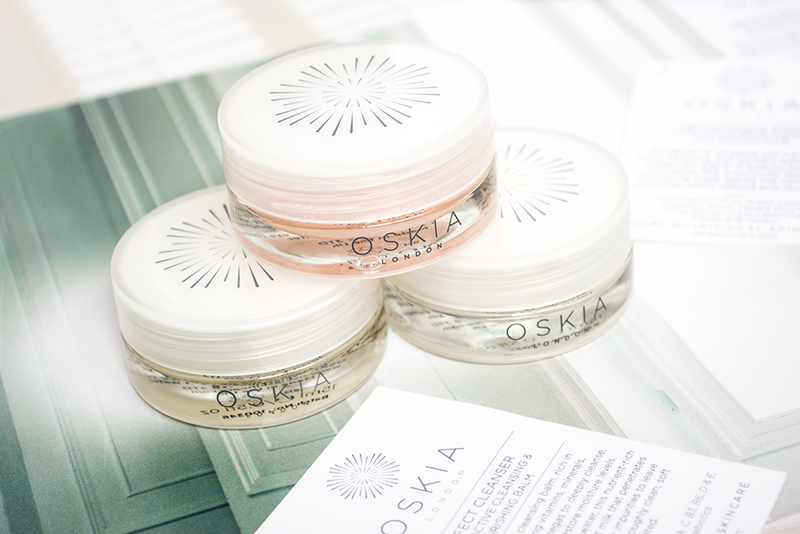 Oskia's products are available at various online stores, including Naturisimo, and you can also find them in person at Space NK stores in the UK & Ireland (see full list of stockists). Have you tried anything from Oskia before? I haven't tried anything from Oskia before, but I've been interested in the Perfect Cleanser. I've been a recent convert to cleansing balms, so this has been on my list to try out. The Renaissance Mask is definitely on my radar. Oskia sounds like such a lovely brand! A lovely one to try as a luxury treat!